Here’s another totally wireless speaker that wants to be your plus one at your next summer BBQ. This Edifier Rave MP700 speaker packs what is described as ‘spacious HI-Fi sound’ and 8hrs of playtime in a slim design that incorporates a unique hybrid stand/handle for £229. Form and function come together here in the conception of the handle which doubles as a speaker stand. It looks cool and shows off the MP700 speaker's dagger edges and flatness. Size-wise this speaker sits outside the ultra-compact arena filled by speakers like the Edifier MP233, SACKit WOOFit, Creative MUVO mini and Jabra Solemate. Instead this Edifier edition is larger, yet still backpack friendly, and the top handle makes it a pleasure to transport. As there are no fabrics or padded materials used on the exterior of this speaker, we can listen to your favourites near the poolside without much worry - although it's not IP rated. On the right side of the speaker is a flap covering an aux-in, a USB port for charging your devices and also the charge port for the speaker itself. On top we have the controls and NFC compatibility. What is utterly bizarre, is that the speaker when charging shows how full the battery is with LED indicators alongside the row of ports - however, when in use, this battery indicator vanishes and this is one of the biggest shortcomings of the whole product. 8 hours is the claimed runtime, and with volume at a notch below 60% we could extract close to 7 hours. If we crank the volume higher, the battery diminishes unsurprisingly quicker - expect 4-5 hours of playback with volume levels at over 90%. Our Rave MP700 has been used mostly via Bluetooth 4.0 and there’s no waiting around as a device connects within 1-2 seconds. There has been zero lag and the range outdoors stretches to approximately 20 metres. Edifier have managed to minimise the quantity of buttons on top by creating pause/play functions with a simultaneous press of the volume up and down buttons. Respectively these buttons can also be used to actually adjust volume, with a single press to incrementally change it. A longer individual press on either button will skip or go back to the beginning of the track being played. Straight away you’ll notice that the Edifier MP700 is capable of being very loud. This is all aided by its two 8W silk dome tweeters, two 10W 70mm drivers and three passive radiators - creating a 36 watt total output. Of course, this is excellent for indoor usage, but venture outside the door and its stocky volume will fill open-wide areas too. Its soundstage isn't quite as wide as the more expensive SACKit MOVEit speaker, but it unveils something that may sound strange - this speaker has a remarkably crisp bass. Whilst a warm sound, the bass is bold but audibly separated from the mid and high ranges. ‘Puttin' on the Ritz’ by Robbie Williams is an excellent song to show off the wide soundstage the MP700 exhibits. The opening piano section flows from left to right of the speaker and the remaining song featuring Robbie’s vocals and orchestra is vividly portrayed. The high ranges satisfy and the emphasised bass no doubt helps to feed the spirit of the music. In truth the Edifier Rave MP700 delivers a universally enjoyable and exciting sound. 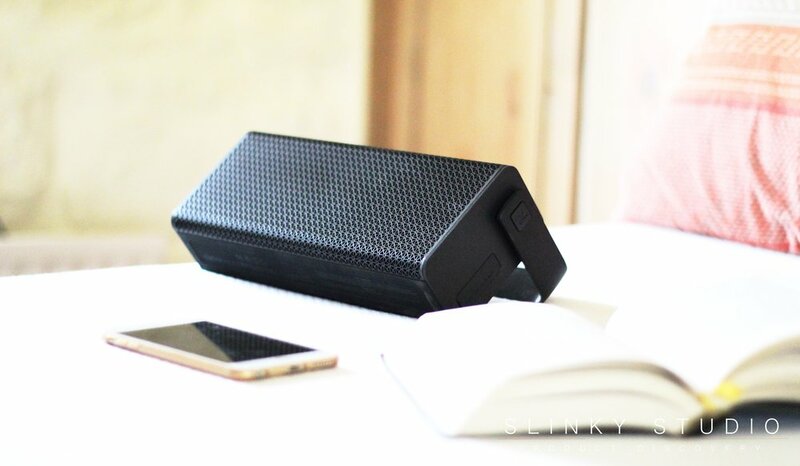 Your entire musical collection will resonate through this speaker. If we throw something like the funk track ‘Henny & Gingerale' by Mayer Hawthorne through the speaker, a song with the deliberate concert-like ambience of an audience in the background with cheering and glasses clinking together, it is heard with crystal clarity. Plus this is a rhythmically fast tempo song and the drumbeat plus vocal arrangements are forthright and truly exhibit the Edifier claim of spacious sound. The Edifier Rave MP700 is a definite challenger to the larger SACKit MOVEit speaker and over £100 cheaper too. Whilst it doesn't offer AirPlay or Wi-Fi integration of any kind, there is a pleasingly noticeable lack of disparity between playing audio via aux-in or Bluetooth 4.0 here. The use of digital signal processing (DSP) and dynamic range control of the audio genuinely enhances playback in quality terms and the volume seems identical in both cases. Interestingly, if we sit the Edifier on its base, audio lacks the same projection as when rested on its stand. Not only can the Edifier Rave MP700 speaker be your trusty summer companion outdoors, with its encouraging portability, but it’s a mini-boombox speaker choice that won’t fail to be heard at your next barbecue.